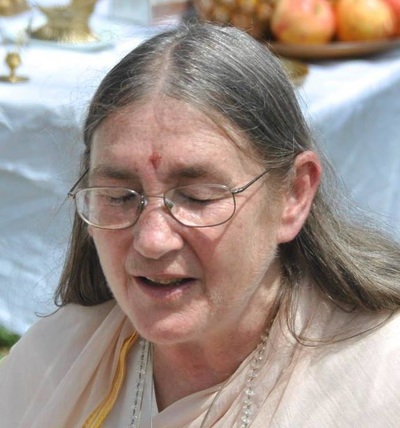 Education: Alakananda Devi, affectionately known as Ma, was born in 1951 in Melton Mowbray, U.K. and was raised in both the Jewish and Christian faiths. In 1976, Alakananda graduated as a physician from St Bartholemews Hospital Medical College, London University. She then spent five years in Catholic convents and Abbeys, making her novitiate in Holy Cross Cistercian Abbey, England, before travelling to India to study with Father Bede Griffiths at Shantivanam. There she met Sadananda who introduced her to Raghudas Maharaj, the hidden master who was to be her guru. She also met Dr. Vasant Lad, her Ayurveda teacher in Poona in 1980. Through her studies with Dr. Lad, Alakananda became one of the first western physicians to take up Ayurveda, and became one of Dr. Lad's first students. Experience: Arriving in the United States with Sadananda, eighty dollars in their pockets and two Indian musical instruments, they travelled to Boulder, Colorado, to found their first ashram in a tipi. Alakananda practiced homatherapy and learned astrology. Moving to Tucson, Arizona, in 1986, they re-started Alandi Ashram in a two-room, back-alley appartment. Again moving in 1988 to a remote cabin in the Rocky Mountains, she made numerous Rocky Mountain wildflower essences, becomming the first physician since Dr. Edward Bach—discoverer of flower remedies—to research and make her own flower essences. 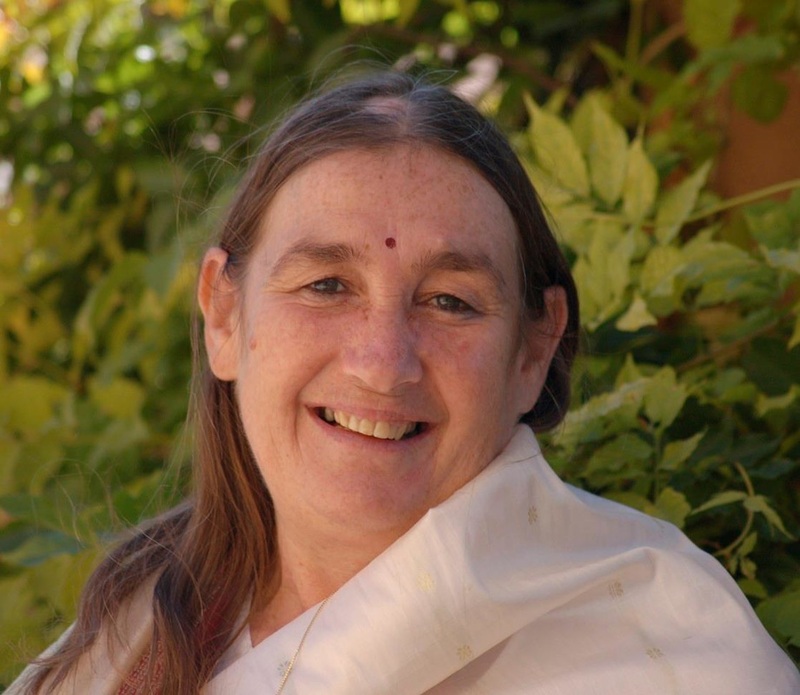 In August of 1990 she and Sadananda restarted Alandi Ashram in its current location in Boulder, Colorado. 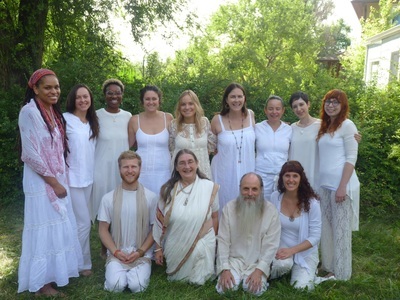 In 1997 the Ashram grew into a residential community, having nine resident members and an additional three full time student participants. In 1998 they began to develop Alandi Ayurvedic Gurukula. Alakananda is a co-founder, spiritual mother, teacher, Ayurvedic practitioner, flower essence maker and storyteller. She is also an accomplished writer with many published articles. Alakananda has written and is self-publishing her autobiographical trilogy Patchwork Mandala. The first two volumes, Pilgrimage to the Mother, and The Rainbow Bridge, are available and well-loved. Her future book plans include, Ayurveda for Elders and Ayurveda for Couples. ​Ma is highly respected and well known in the Ayurveda community as a renowned senior Ayurveda practitioner, both nationally and internationally. She is a member of the board of directors of NAMA. She has been a keynote presenter and popular speaker both at NAMA conferences and at the Swasti International Ayurvedic conference in London. Other personal info (family, pets, hobbies): Alakananda Ma enjoys spending time with her students and clients, writing blogs, and practicing her violin. She and her partner, Sadananda, grow a robust garden each summer and cook delicious Ayurvedic meals with the garden’s bounty. They enjoy taking walks and are active members of the community.